Grilamid TR® grades are amorphous thermoplastics which, due to their composition, combine the excellent properties of semi-crystalline polyamide 12 grades with those of an amorphous thermoplastic in a unique way. This is highlighted in some of the exceptional characteristics which include high chemical and stress crack resistance combined with excellent transparency. Grilamid TR® is a transparent polymer in granulated form, which combines a variety of excellent properties. This product is such that specific property requirements can be achieved through modification of the material. A noble polymer with unlimited possibilities! Compared to the known semi-crystalline polyamides, crystallization of the macromolecules is prevented by carefully selecting the monomers, resulting in polymers with amorphous structure which brings a strikingly high level of transparency. 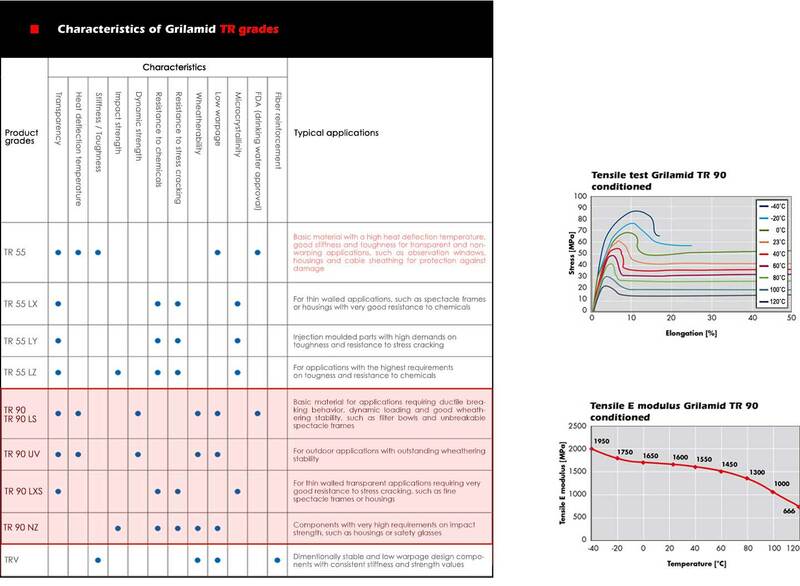 Grilamid TR® grades combine the properties of semi-crystalline polyamides whith those of amorphous polymers in a unique way, currently not achieved by any other trasparent thermo-plastics. In addition to transparency, other outstanding properties include excellent flexural fatigue strength, which facilitates applications under dynamic loading, and high resistance to chemicals, resulting in low susceptability to stress cracking when in contact with media. The well known tendency of amorphous thermo plastics to suffer from stress cracking, which is very often at the root of component failure, is a rare phenomenon in the case of Grilamid TR®. The cycloaliphatic Grilamid TR® grades also offer excellent weathering and UV resistance. Members of the Grilamid TR product family are amophous poly- amides which differ from one another due to their chemical structure. Building on these basic polymers, variants have been developed which offer additional properties. With higher flexural fatigue strength and UV resistance. TRV Reinforced with fibers, maximum dimentional stability. Grilamid TR is characterized by its impressive dynamic loading capacity, which results in extemely high fatigue strength. This unique property allows the use of transparent polymers even in safety critical applications such as water filter housings in sanitary installations. The formation of stress cracks (also known as environmental stress cracking) is the most common cause of damage to plastic components and is particularly critical in the case of trasparent plastic materials. It involves the formation of cracks due to the effects of contact media on plastic components under stress. The resistance to stress cracking of trasparent materials is tested using the Bent Strip Method. The diagram below shows the values of flexural stress, in MPa, at which the stress cracks are visibly apparent after one minute of contact with the liquid medium. Isolated incidents of clouding which occur are not recorded in the diagram. Thanks to its chemical structure, Grilamid TR exhibits excellent resistance to stress cracking compared with other transparent plastic materials in both polar media (e.g. 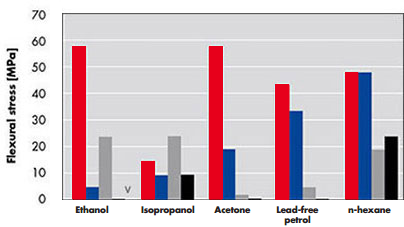 ethanol, isopropanol) and non-polar media (petrol, hexane). In order to provide a clear overview, only flexural stress up to 60 MPa is shown, although it may sometimes be considerably higher. *Grilamid® and Grilamid TR®are trademarks of EMS-CHEMIE HOLDING GROUP, Switzerland. Summer Cart shopping cart software Copyright © 2013-2019 CARI STYLE Ltd. Sofia, Bulgaria. All rights reserved.